There are so many reasons to love the Smoky Mountains and the Appalachian Trail is one of them. 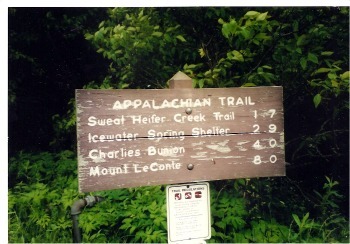 There's something about the AT that seems to beckon hikers to it. Of the many that attempt to complete it each year, few finish it. But who says you have to hike the whole thing? Hey, it is almost 2,200 miles long! You may not have the time, desire, or physical capabilities to do that. That's what's great about the AT. There are lots of awesome section and loop hikes in the Smokies that you could hike. Before I tell you about some of them, please know that the AT is the only trail in the park that is marked with a white blaze. Keeping this in mind will help orient you out on the trail. Now, on to the hikes! Mount Cammerer, Hike to Views and History Along the Appalachian Trail! Clingmans Dome, The Highest Point Along the Entire AT!